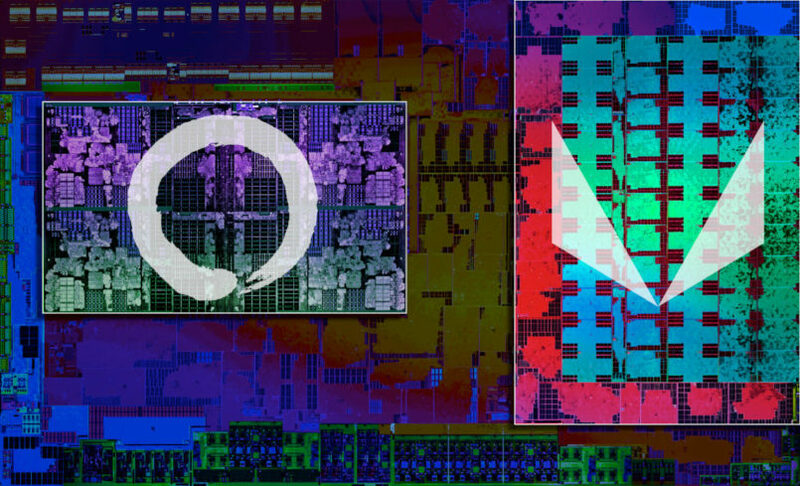 When it comes to AMD’s Ryzen CPUs and platform as a whole, it would seem the second time’s the charm. 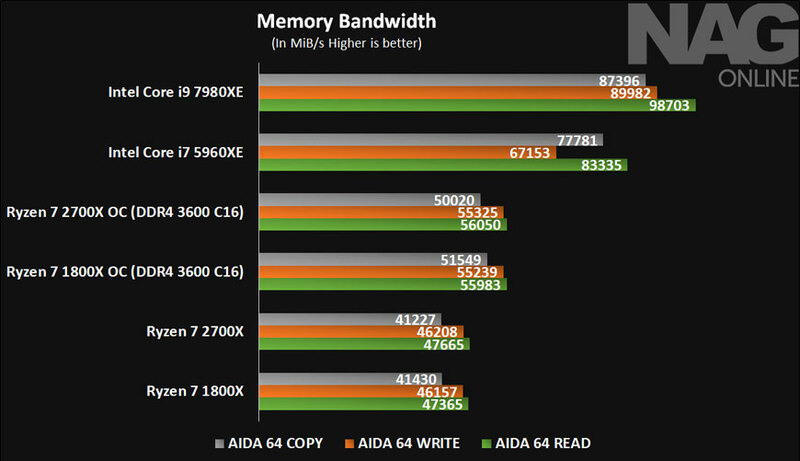 Last year saw AMD return to form with a vengeance, and I’d imagine their comeback is what pushed Intel to release their first six-core CPU for the high-performance desktop segment. It’s a rare example of competition actually fulfilling the promise of ever-forward momentum that a competitive market is supposed to promote. I’m sure you have your own feelings about the execution and release of the Ryzen and subsequent Threadripper CPUs – but it has to be acknowledged that after a decade of releasing sub-standard CPUs with few (if any) redeeming qualities, AMD performed a miracle and immediately reminded us why AMD is a technology company worthy of all its praise and attention. Gone were the marketing and corporate justifications advocating for an underperforming, three-core CPU based on a dubious link between last-generation consoles and PC gaming. AMD simply rolled up its sleeves and did what it does best – producing well-designed CPUs, at the very least from a high-level perspective. The execution may have been lacking (to put it mildly), but as microcode updates rolled out, things improved drastically. 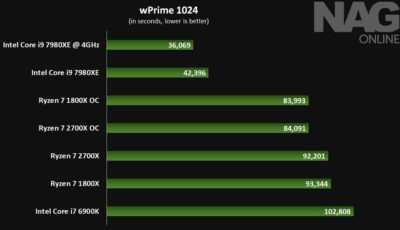 In an effort to not repeat the mistakes of the previous release, AMD’s Ryzen 2 (or Pinnacle Ridge) refresh is essentially giving us what I imagine AMD had wanted to achieve with Summit Ridge the first time around. If Summit Ridge hadn’t been hit with a few snags, we’d likely be looking at an even more aggressive release schedule from their competition – who this year will have their own eight-core, high-end desktop part stepping up to compete. I’m getting side-tracked though, as this review is about Ryzen 2 – which, believe it or not, has far fewer changes than you’d think. 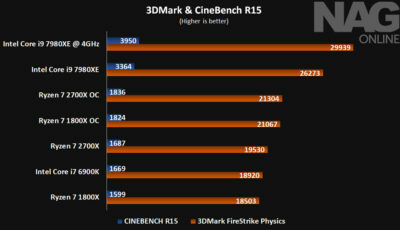 That doesn’t mean the improvements aren’t worthwhile, but as far as we’re concerned, almost everything has remained the same, with the single biggest difference being the marginally increased clock frequencies and better single-core clock frequency management via XFR 2 (Extended Frequency Range 2). In order to explain what XFR 2 is though, one needs to understand how the original XFR worked. The best way to do that is to relate it to how Turbo clock frequencies work on the competition’s platform, since they pioneered this method of boosting performance in the consumer space. 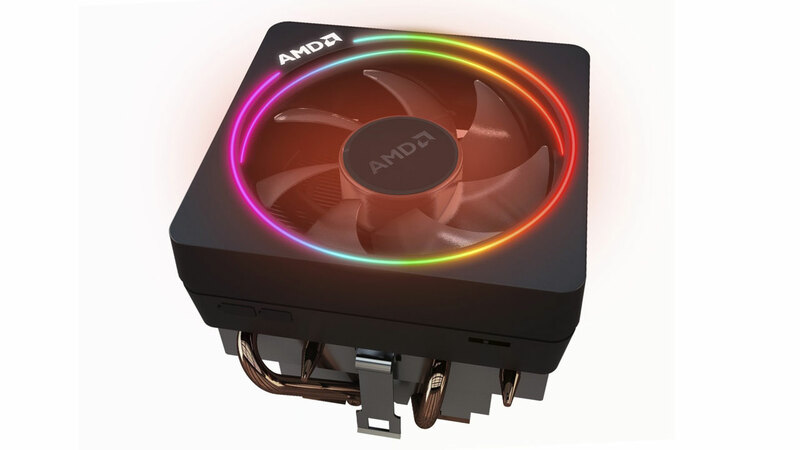 AMD’s Ryzen CPUs regulate clock frequency based on load, thermal headroom and power consumption, as is the case with virtually all modern-day processors. AMD terms their technologies and methods of regulating all of this “SenseMI”, and XFR is part of the SenseMI family of mechanisms. The long and the short of it is that if the CPU determines there’s headroom in temperature, voltage and power consumption, it’ll boost the frequency of the relevant cores accordingly so as to reach a point where the system is providing optimum performance, without exceeding its thermal and/or power design specifications. The steps in which XFR is able to do this is related to how the CPU itself deals with the internal clock, which is in 25MHz increments. Simply put, it means the CPU is able to use 0.25, 0.5 and 1.0 multipliers from 5.5 to 80 within independent CCX units and cores. Precision Boost, which is also part of SenseMI, is a key part in ensuring XFR works. Precision Boost works across two cores, while XFR essentially works on a single-core basis with clock frequencies as high as 4.1GHz on the first-generation Summit Ridge Ryzen parts (like the Ryzen 7 1800X). XFR 2 on Pinnacle Ridge takes this up a notch, allowing clock frequencies as high as 4.35GHz on a single core (conditions permitting, of course). 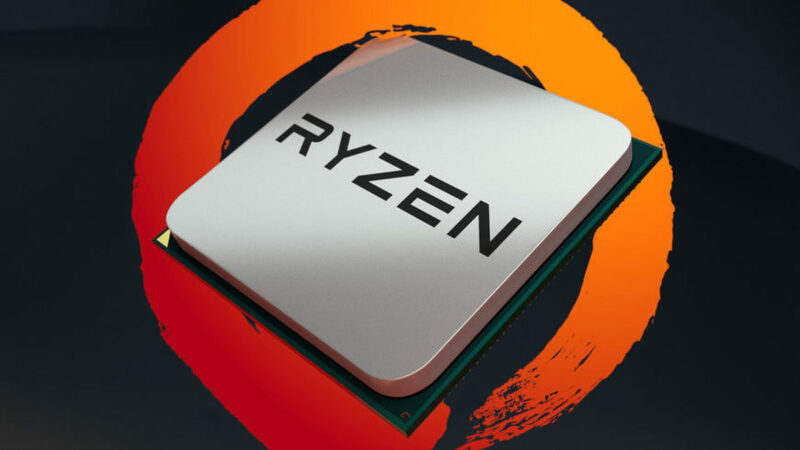 It’s a substantial boost in clock frequency, given the node and process with which Ryzen CPUs are manufactured – a process which was initially designed for low-power operation and consumption, not for clock-frequency scaling. 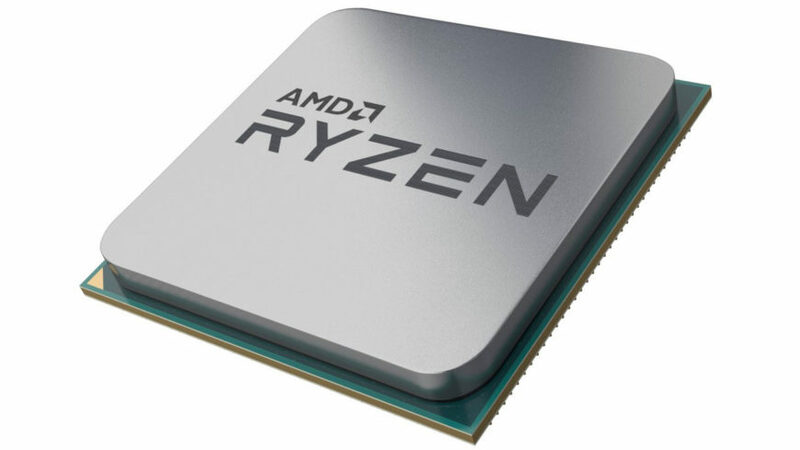 Largely thanks to the optical die shrink that these second-generation Ryzen CPUs have undergone, AMD has been able to gain some performance by increasing clock frequencies a little more, lowering operating voltages, and tuning cache bandwidth and latency, all of which results in an improved user experience. As a side note, it’s worth noting that the act of increasing internal clock frequency alone, with all the cache levels operating at the same frequency, has a net effect of lowering cache latency too. 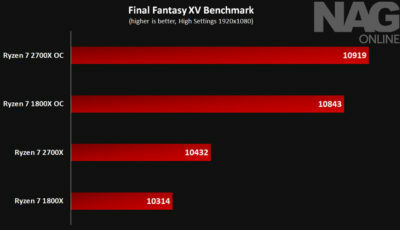 As such, that particular improvement would exist regardless of any specialized attention AMD has given to this area. 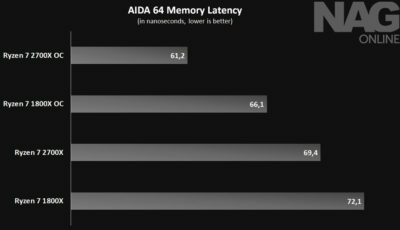 That AMD has managed to not only reduce these latencies, but increase clock frequencies too, bodes well for us as it allows for performance levels not easily attained with the first-generation Ryzen CPUs. All of the above is just background information though, and it’s not really relevant to everyday use or even overclocking of the platform. The important thing about the Ryzen 2000 series (and specifically the 2700X under scrutiny here) is that it’s now capable of operating at significantly lower voltages to achieve the same clock frequency when compared to the 1800X. By that I mean it’s possible to operate the CPU at 4GHz across all cores using only 1.15V, down from the previous 1.4V on the 1800X, for example. What that does is lower not only power draw, but heat output as well. This is rather significant, as we should start seeing many more Ryzen-based portables, especially with the low TDP variants of these CPUs. It’s something that was a little more challenging to accomplish before. For this review, I directly compared the Ryzen 7 1800X to the 2700X, not only in terms of performance but in those ever-so-important power and temperature measurements as well. I stand firmly by my belief that, had AMD had more time with the initial Ryzen CPU, we’d have had something closer to the CPU we see today a year ago already. The small, but numerous improvements AMD has made are well worth celebrating, as they bring the fight to the competition not only in aggressive pricing, but in power and performance too. 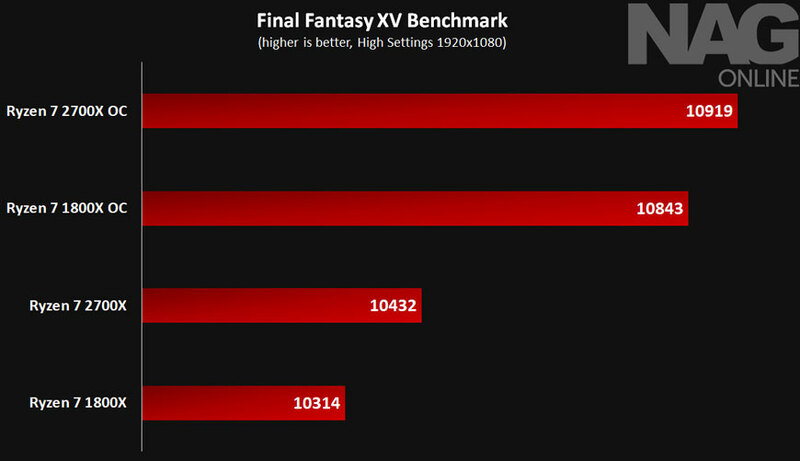 In the first set of tests, you can see that the 2700X is a little faster than the outgoing 1800X. The margins are small, but such is the case for most CPU tests these days. 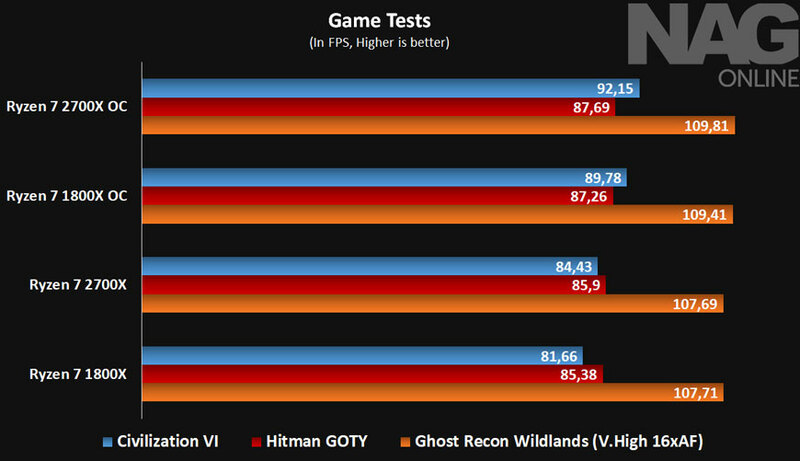 Resolutions higher than FHD place greater dependency on the GPU, thus it becomes a GPU test. As small as the in-game differences may be between the 1800X and the 2700X, with the arrival of the 2700X there’s simply no reason to purchase or consider the 1800X unless you can find one second-hand at a very good price. In the second set of tests, I looked at scaling with a maximum 4GHz CPU clock, from DDR4 3,200MHz (base performance) right through to DDR4 3,600MHz. Here things seem to scale in an identical manner – so no surprises there. 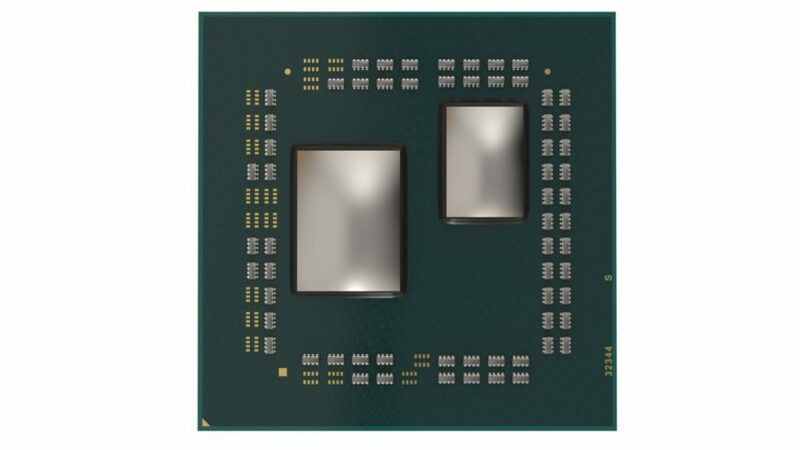 What’s worth noting is that even though Ryzen 7 2000-series CPUs are designed to support identical frequencies as before, the IMC has received some compatibility improvements and tuning, which should see a lot more CPUs capable of 3,200MT/s with both Samsung B-die based kits and of course Hynix XFR-based memory. It’s no longer a roll of the dice, and just about every 3,200MT/s kit should do the trick. I didn’t get a chance to test a Hynix-based 3,200MT/s set, but I have it on good authority that it works as intended. 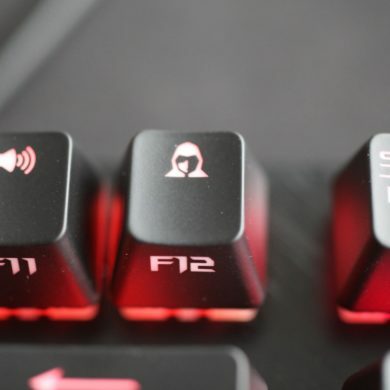 With some CPUs and motherboard combinations capable of frequencies as high as 3,733MHz, we can safely say that AMD and its partners have made incredible progress in tuning not only compatibility, but performance and overclocking headroom as well. I believe we may see vendors like G.SKILL releasing AMD-specific DDR4 3,600MHz kits sometime this year. In terms of raw clock speeds, this is where some may find that the Ryzen 2700X is a little disappointing. Just so you’re aware, I don’t share this perspective myself, as I believe that overclocking the CPU for anything other than competitive purposes or specific productivity workloads yields little to no value. 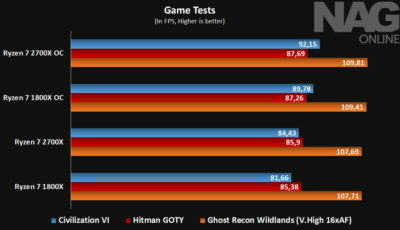 The reason I say that is that even at 4GHz, what we find is that most game performance is GPU-bound. And even when it isn’t, the difference between frame rates isn’t anything our displays would be capable of leveraging (180fps versus 166fps, for example), and our GPUs wouldn’t be able to deal with. Overclocking for the sake of gaming is literally introducing a bottleneck, one that’s not only wasteful in power draw, but also results in needless heat output – which results in more wasted power as your system works harder to stay cool. I wouldn’t recommend overclocking this CPU if all you’re looking for is a better gaming experience. It simply won’t materialize. That said, should you insist on overclocking the CPU, you’ll find that the Ryzen 2700X quickly runs out of steam at about 4.2GHz. It’s a good 100MHz higher than what the best of the previous-generation Ryzen’s could deliver, but 100Mhz simply isn’t enough of a boost to make a meaningful difference in your games. Moreover, for that 100Mhz gain, the required operating voltage is significantly higher. 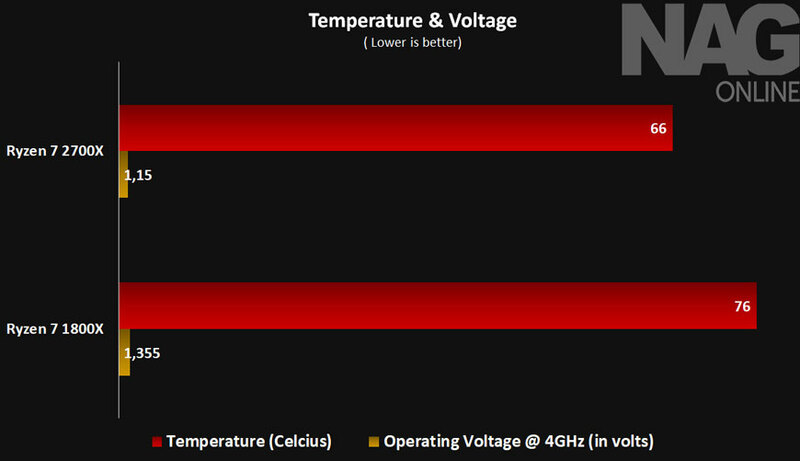 You’re looking at going from 1.2V at 4.1GHz, to 1.35V just to hit 4.2GHz. It’s not a sensible thing to do, but when viewed against the 1800X, this does speak to the improvements AMD has made, as previous Ryzen CPUs typically needed 1.4V or so for 4 to 4.1GHz. Again, my personal advice on the platform is that one shouldn’t look at overclocking it at all, as you do get 3.7GHz operation out the box across all cores, and XFR 2 gives you up to 4.35GHz on a single core. You could consider running the system at 4GHz across all eight cores though, and the good news here is that you may just be able to do that at ridiculously low voltages. The sample I received needed only 1.15V, and I know of others that need only 1.125V for the same frequency, when cooled with an AIO. For the competitive overclockers among you, as with all the CPUs I test I had the opportunity to see what the 2700X is capable of when cooled with liquid nitrogen. It managed to hit 5.5GHz pretty comfortably, which is a good 100MHz higher than the best 1800X on record. To clarify, that’s the best Summit Ridge CPU ever recorded, and it’s still inferior to the worst 2700X you can buy off the shelf. 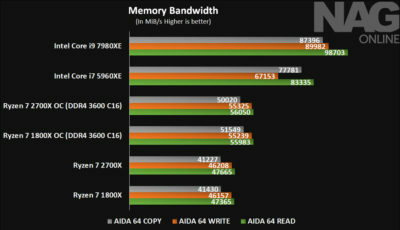 In that respect, AMD has done a truly stellar job. 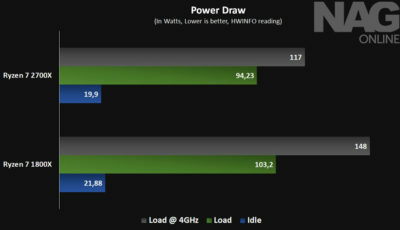 As it stands, the highest CPU frequency on record for AMD is currently 6GHz – achieved by yours truly using the ASUS Crosshair VII Hero motherboard, the review for which will be posted soon. My thoughts on this CPU are best summed up as “Ryzen refined”. It’s similar enough to the previous generation that I’d have understood and found it perfectly credible if AMD had opted to augment the names of its Pinnacle Ridge processors with a naming scheme like 1750, 1850X, etc. I prefer the 2000 branding as it makes life so much easier, but in reality we’re looking at a collection of minor updates here. Thankfully, when they’re all put together, they make for a rather impressive CPU that manages to make a compelling case for itself even in light of what the competition is offering. So how do I rate the Ryzen 2700X in a world where virtually every piece of hardware that has a working power button gets an award of some kind? 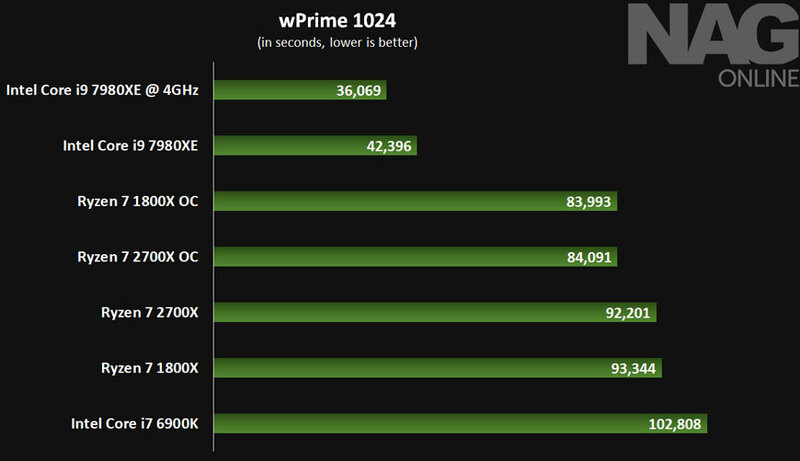 I would say this is as perfect an implementation of Ryzen as we’ve yet seen, and insofar as refinement of an existing processor is concerned, the Ryzen 2700X deserves its 9/10 score and its hardware award. I’d go so far as to say that I could now comfortably use an AMD-powered system for my everyday work and gaming, which is something I wouldn’t commit to with AMD’s previous entry. If you don’t want to make any concessions and major sacrifices when moving from an Intel Core-based system to an AMD offering, this is the CPU that makes the most compelling case for such a migration. 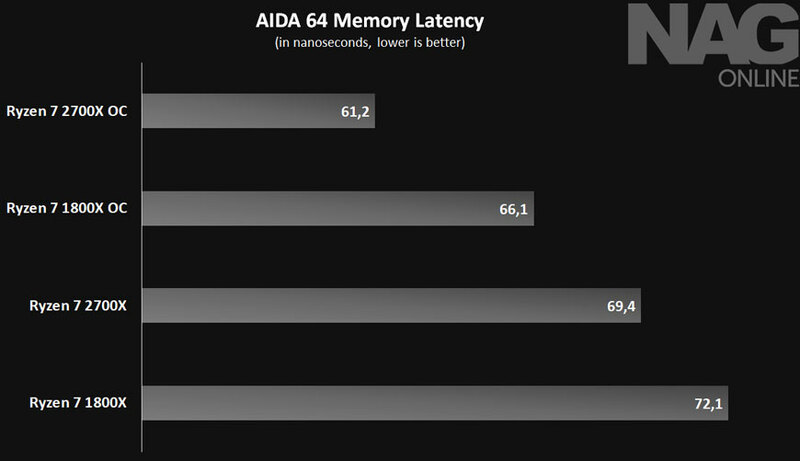 AMD has a real winner on their hands this time, and I’m properly impressed. 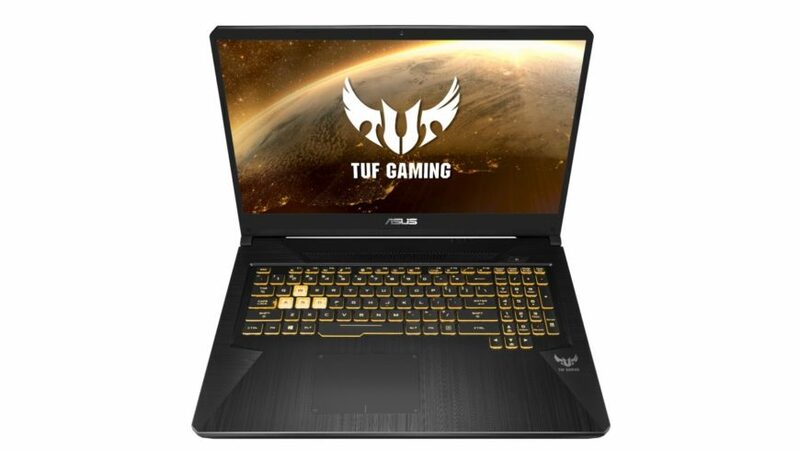 This is a worthwhile buy in every way, and certainly one that makes for a valid option when building a high-end gaming machine in 2018. 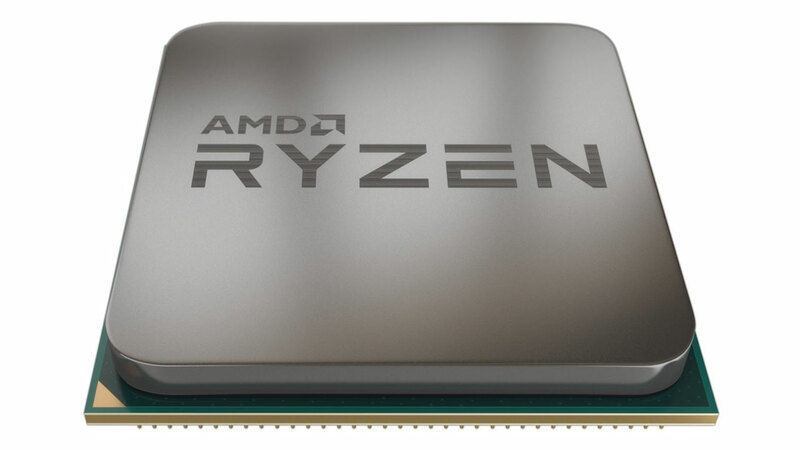 9The second-generation Ryzen CPUs are a welcome improvement over what was initially offered a year ago. The advancements AMD has made are small but numerous, and as a package it all comes together in a way that finally makes AMD a realistically viable choice for high-end gaming.